Make the Sign of the Cross and say the "Apostles Creed". Say ten "Hail Marys", while meditating on the mystery. Say the Glory be to the Father and the "Fatima Prayer". Announce the second mystery; then say the "Our Father". Repeat 6 and 7, and continue with third, fourth, and fifth mysteries in the same manner. 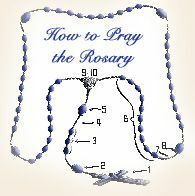 Say the "Prayer After the Rosary". Hail, Holy Queen, Mother of Mercy, our life, our sweetness, and our hope. To you do we cry, poor banished children of Eve. To you do we send up our sighs, mourning and weeping in this valley of tears. Turn then, most gracious advocate, your eyes of mercy toward us, and after this our exile, show unto us the blessed fruit of your womb, Jesus. O clement, O loving, O sweet Virgin Mary! Pray for us, O holy Mother of God. That we may be made worthy of the promises of Christ. O God, whose only-begotten Son, by his life, death, and resurrection, has purchased for us the rewards of eternal life; grant, we beseech you, that we who meditate upon these mysteries of the most holy rosary of the Blessed Virgin Mary, may imitate what they contain and obtain what they promise. We ask this through Christ our Lord. Amen.